The trip consisted of two parts. 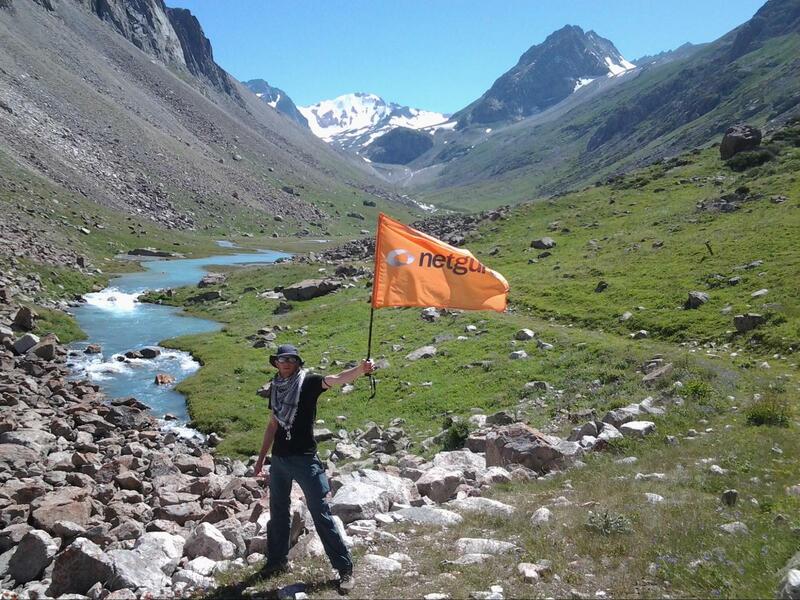 The first involved getting to the Ala-Archa valley in Kyrgyzstan and heading up the Ak-Sai river in order to climb one of the highest peaks in the area - Peak Korona (4860 m). 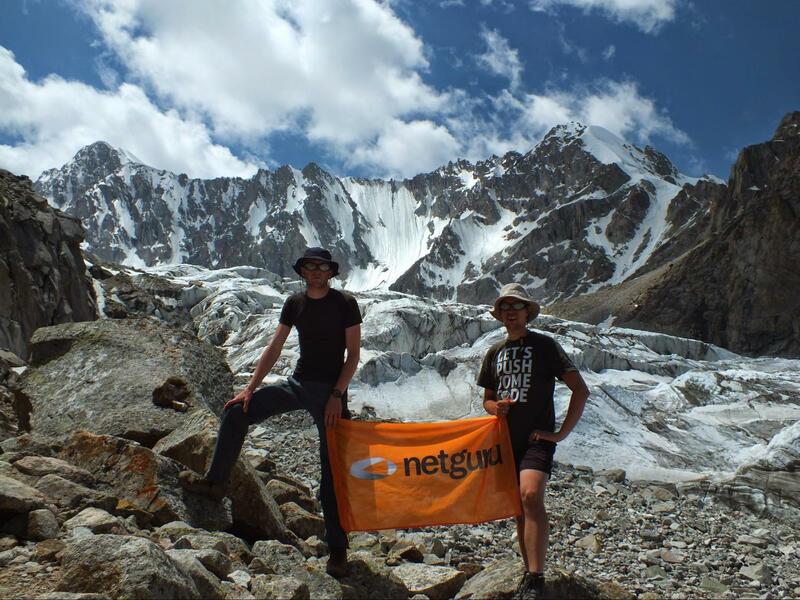 In terms of challenge, we opted for Korona as our main target due to its enticing combination of high altitude, glaciers and the potential for rock climbing. Russian sources presented it as a relatively easy rock climb (Soviet climbing grade 2A), which fitted the bill given our novice climbing skills. 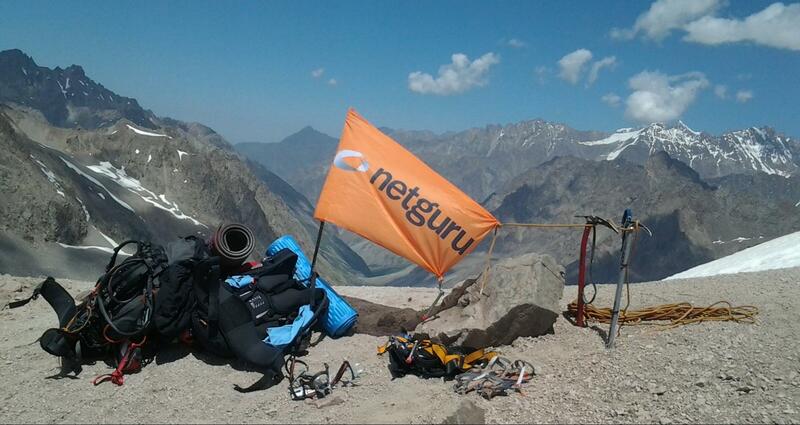 Most importantly, the basecamp was easily accessible: only 40 km away from Bishkek, the Kyrgyz capital. After the descent from Korona, we still had a few days left, so we decided to cross the mountains via the Ala-Archa pass in order to explore the southern, wilder part of the mountains, a land of colourful pastures, yurts, wild horses and nomadic shepherds. Arranging the schedule for this trip was an absolute nightmare: the only reasonable internet resources covering that part of Kyrgyzstan are a couple of Russian climbing sites describing some ascents from 10-20 years ago, and one site which provides scans of 30-year-old Soviet military maps with no mountain names indicated whatsoever. We ended up marking the mountain names manually based on the altitudes. 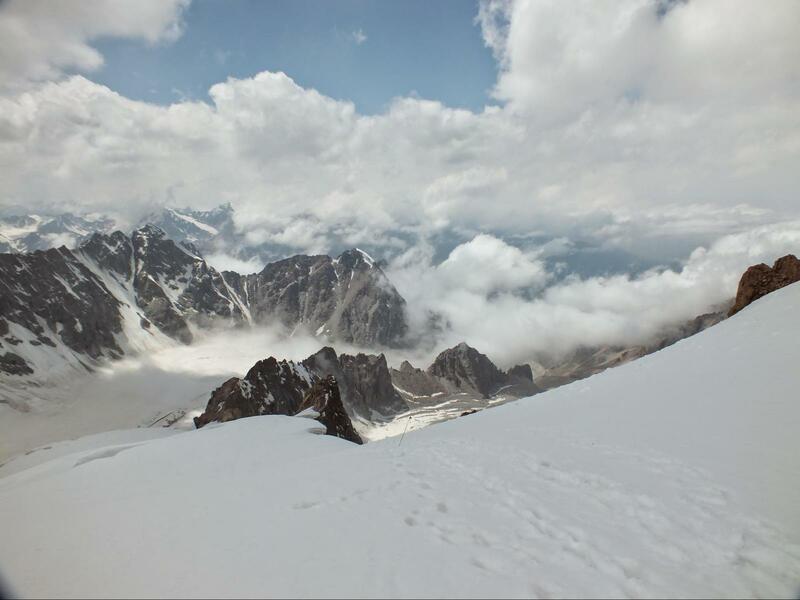 Fortunately, a Google images search for “Peak Korona Kyrgyzstan” provided us with enough information to be able to recognize the mountain once we got there. It took us three days to get to Kyrgyzstan, including a drive to Berlin, a forced stop-over in Istanbul due to a flight delay, and another day for buying camping gas and other supplies in Bishkek. Finally, we reached the bottom of the Ala-Archa valley, near a mountain hostel with a surprisingly German-sounding name Alplager. 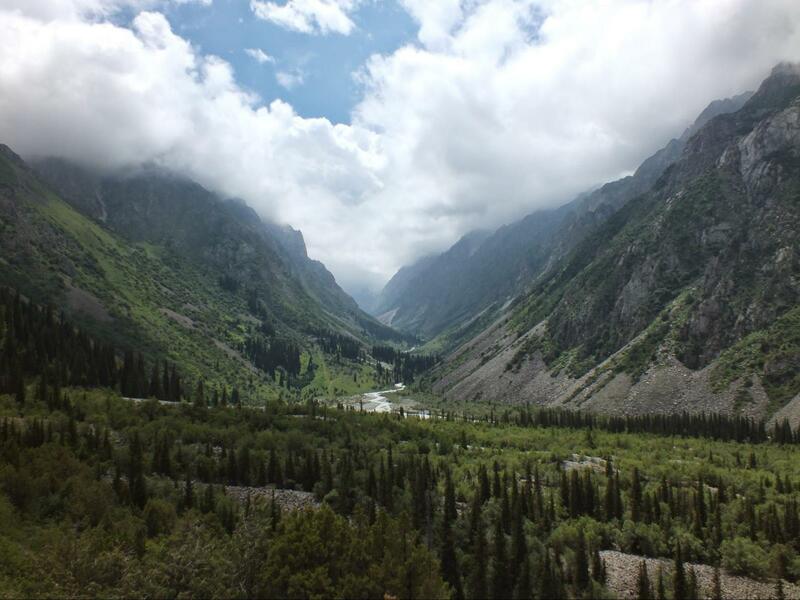 The bottom of Ala-Archa valley, thanks to its proximity to Bishkek, is a very popular place among the local folk. Situated at 2200 m but at the same time easily accessible by car, it is a perfect spot for Kyrgyz families to head out for a Saturday picnic - to rustle up a shashlik, or cook some broth on a bonfire beside the river. This contrasts with the Alplager building, a weirdly out-of-place triangular construction that aspires to be an oasis of Europeanness but is basically an overpriced hostel with all-year-round Christmas lights of various colours flashing throughout the night. 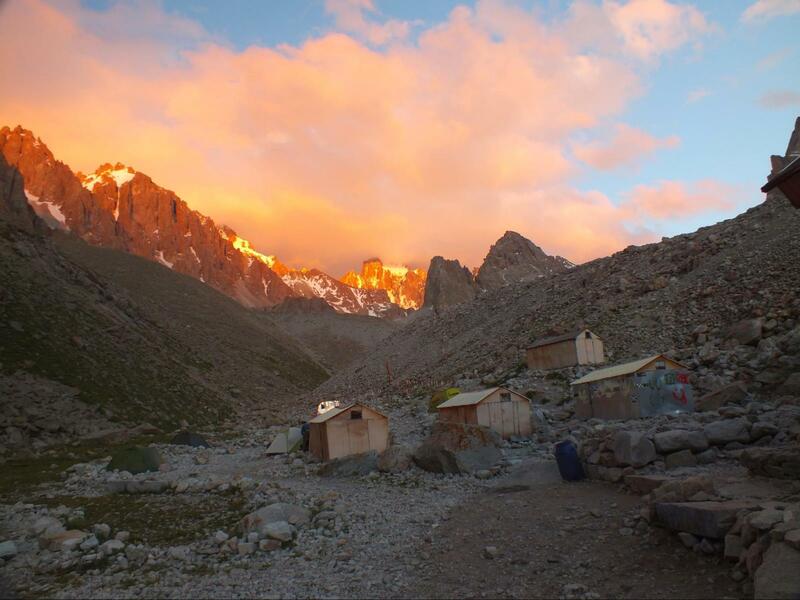 One thousand metres higher, the camp around Racek hut is an entirely different world. The camp is squeezed into a lovely, almost windless spot between a waterfall and a 10-meter-high moraine, which has an excellent view across the serak-filled slope of the nearby Ak-Sai glacier. You could well spend days there without meeting a single person from Kyrgyzstan, perhaps with the minor exception of a few mountain guides. However, the place is teeming with life and has a strong international feel. Each evening, the field kitchen (held in one of the barracks next to the main hut) would fill up with multilingual chatter accompanied by the smell of Israeli coffee, Czech garlic and fried Polish bacon. We managed to make a couple of friends out there who would accompany us for the next couple of days. A two-hour walk above the camp brings you to the slope of the glacier - a terrifying wall of unstable ice, strewn with seraks (over 5 meter high, sharp or pointed blocks of ice) and crevasses. Seemingly peaceful in the morning, the cracks in the glacier turn into rapidly flowing streams in the afternoon, capable of flushing man-sized rocks down the valley with a rumble audible hundreds of meters away from its origin. This summons the notion of a world in motion or, as a famous Polish philosopher once put it: the only constant thing is change. Fortunately, the path winds along the side of the valley, just a few meters above the glacier. The moraine is not really easy to cross either, with hundreds of loose stones falling from underneath your feet with each step. Occasionally, even a larger rock might wobble or slide down if you step on it at the wrong angle. Still, it feels like a walk in the park compared to the dangers of the glacier below. A few hundred meters further up, the bottom of the valley flattens out, and the glacier surface becomes smooth enough to be traversed. We secure ourselves with a rope and proceed to cross the glacier, walking slowly, step by step, uphill. At this altitude (about 4000 m) the low amount of oxygen in the air is already palpable: your head feels dizzy and each step, even on flat terrain, requires a great deal of determination, and walking up a flight of stairs makes you feel as if you just finished a marathon. Even if you feel well at the beginning, it is vital to pace yourself well at the early stage. We learned this the hard way while climbing Kazbek (Georgia) two years ago and we are determined to avoid the altitude sickness this time. At the first symptoms of nausea, stop and take a break. Keep yourself well hydrated even if you don’t feel thirsty. Allocate enough time for acclimatization. We keep repeating these rules every fifteen minutes. At dusk, exhausted but happy, we reach the upper camp, located at the very base of our final goal - Korona Peak. The upper camp is a small, wobbly barrack, made of a wooden frame covered with loosely attached steel sheets. Guests are welcomed by a rusty inscription “Hotel Korona” written above a decrepit bench. Having crossed a foyer with a creaking floor, we enter a dim room. Two heavily-bearded Russian beaver-men are lying on a wooden cot, wrapped tightly in sleeping bags. We are greeted with the smell of tea, cabbage, and canned fish, and the dulcet tones of Rammstein being played from a mobile phone. A classic Russian kettle, old gas cartridges and a few bottles of energy concoctions cover the table. 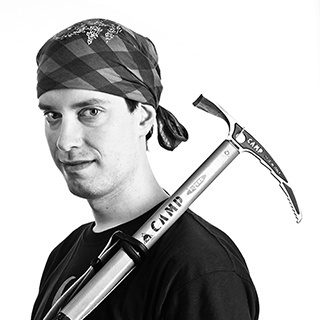 The walls are adorned with climbing equipment, maps, and photographs of climbing routes, as well as an unexpectedly large collection of naked female breasts. At night, even a fairly gentle wind feels like a hurricane, howling, randomly banging loose ropes against the metal and shaking the whole construction. Still, the hut does offer some respite from the rain and cold, so we decide to stay inside. 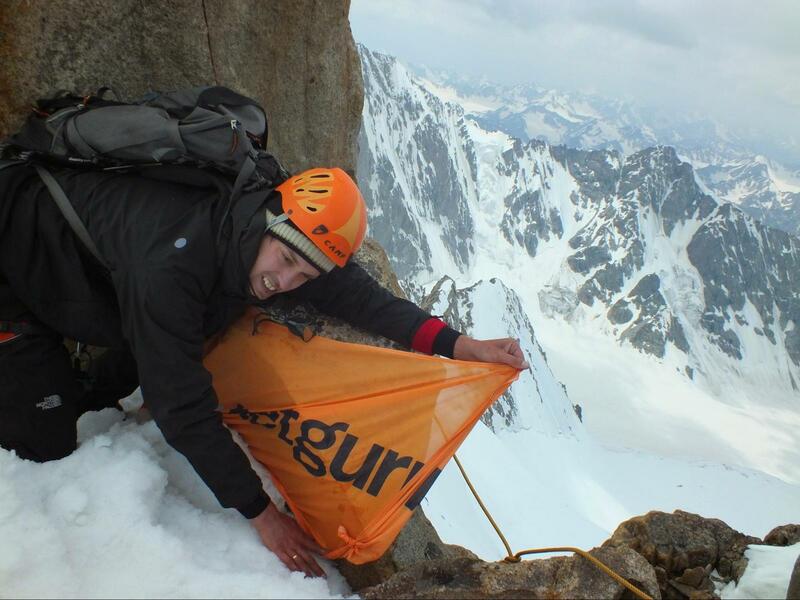 The temperature drops to about zero Celsius at night, but that poses no major problems for our new sleeping bags (thanks to Netguru for the sponsorship!). 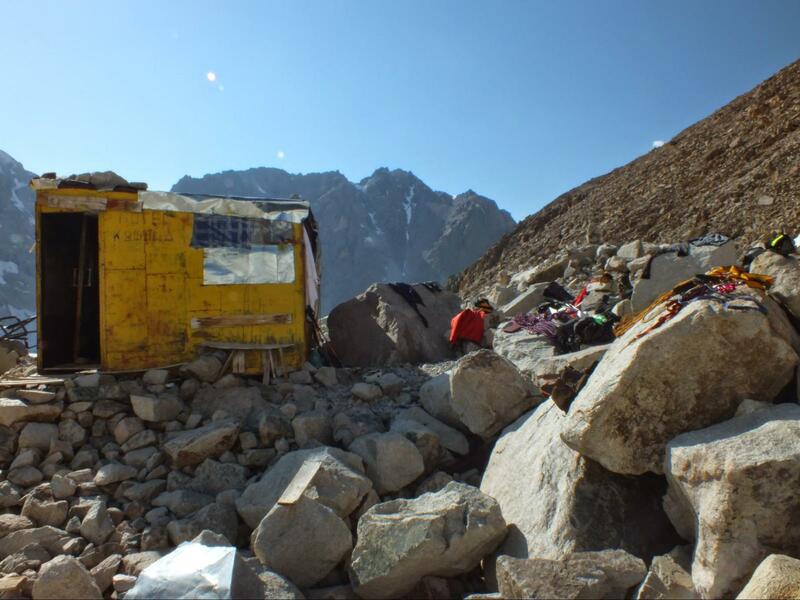 Two days later, it turns out staying inside has been an excellent choice - a couple of less fortunate members from another Russian party camping in tents in front of the hut come down with a cold which, at this altitude, can evolve into pneumonia in the matter of a day. Final stage: the ascent to Korona Peak. We set out at 5:30 am, climbing gear attached. Shortly after us, a larger team of Russians joins us along the same path, later deviating to the right in order to attack the lower but slightly more difficult Isiskatel Peak. 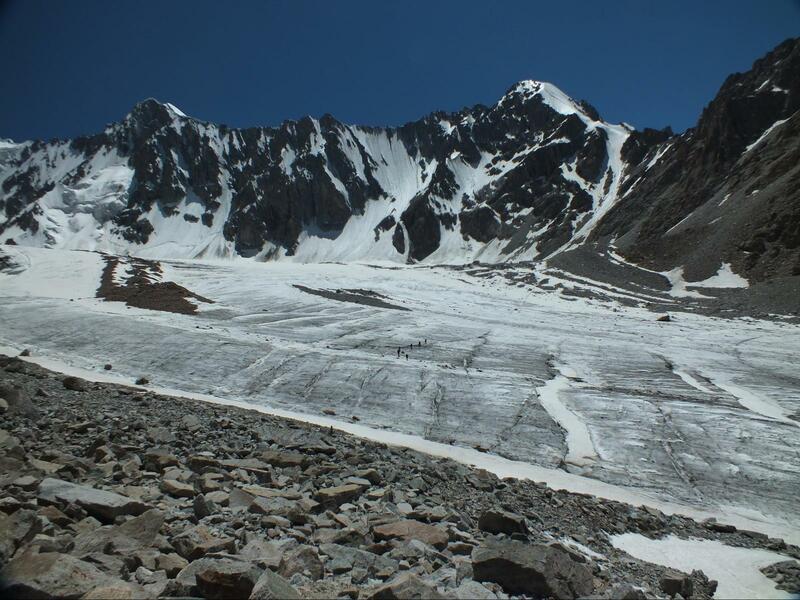 The glacier forms a sort of giant set of steps, with interlacing almost flat areas and over 50o steep snow. The sun has not risen above the mountain yet and the snow is hard and steady, allowing for a quick climb. The problems begin just about 150m below the very top: the “towers” of Korona Peak are only accessible via a very steep (60o-70o) slope, which ends in a meter-wide bergschrund (a long horizontal crevasse, visible on the photo). The snow is mixed with patches of slippery ice and the winter equipment finally comes in handy. 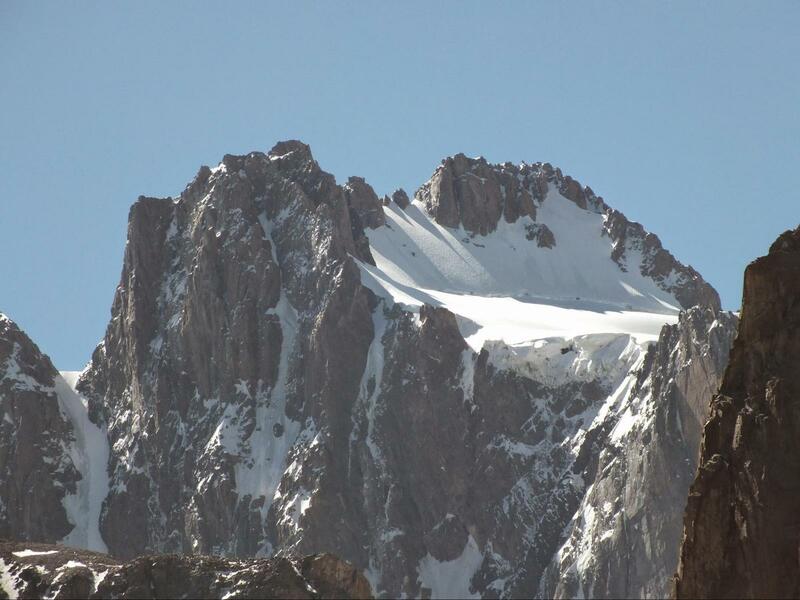 The final stage offers a dose of plain old rock climbing on one of the towers, or “teeth” from which the peak takes its name - Korona is a Russian (and also Polish) word meaning ‘crown’. We try the third, highest tower at first, but after a few unsuccessful attempts we settle for the second one, thanks to its good access from the ice field and a clear way to the top. The views from the peak are magnificent but the freezing wind does its best to keep our enjoyment at bay. We did not expect going down to be easier, but we hoped it would at least be faster than climbing up. That was not the case, however. In the course of the day, the sun has melted the glacier and every five steps we fall waist deep into the snow. Tired but contented, we reach the “Hotel Korona” at 4:30 pm, grab a quick bowl of instant noodles and bury ourselves in the sleeping bags to spend the rest of the day reading books. After a plate of mante (meat dumplings) and fresh vegetable salad at the Alplager, we take some time to decide how to spend the remaining 5 days of the trip. Eventually, we choose to take an old road heading south, deep into the main Ala-Archa valley. The road, built by the Soviets a few decades ago, might have been traversable by a 4-wheel-drive vehicle in the 1990s up to a certain point, but nowadays has fallen into disuse. Roaring streams with no bridges whatsoever cross the path, and fording them takes an unreasonably large amount of time. 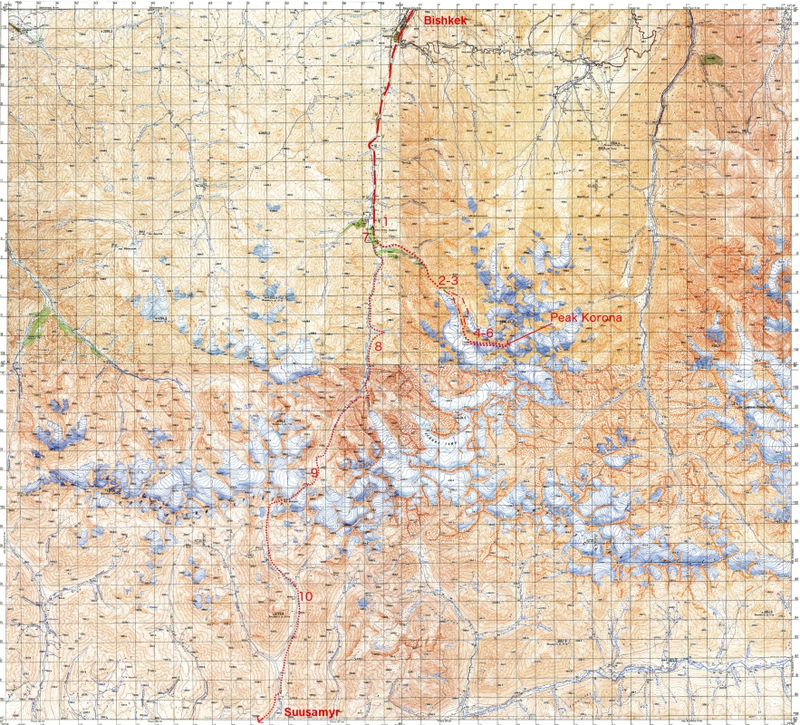 In the upper parts of the valley, the road is virtually non-existent: the only remnants are broken lines of stones scattered along the meadow, hardly visible among the multitude of waist-high mountain flowers. This part of the mountains has a solitary feel: we spend the entire two days hiking across the pass without meeting a single person. 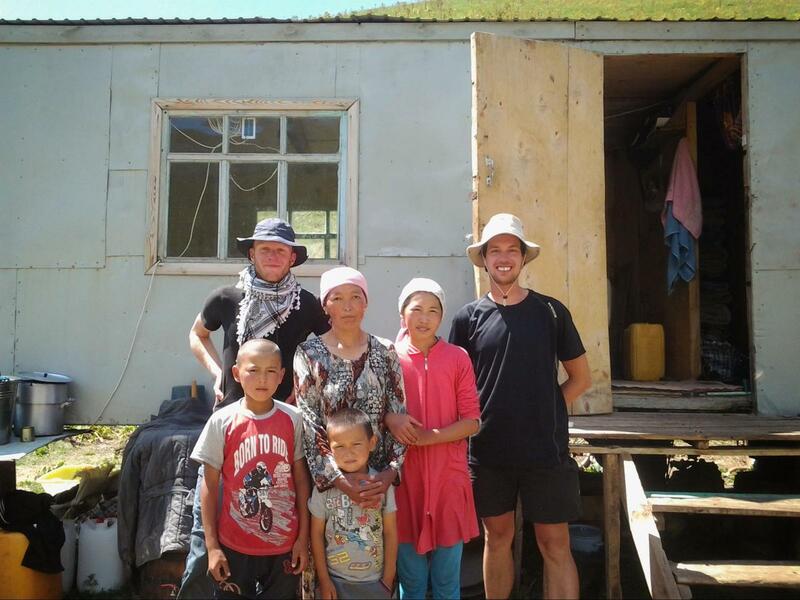 On the southern side, the path reaches a larger valley, where we finally manage to catch a taste of what the “real” Kyrgyz culture looks like. Herds of sheep, cows and horses roam the hills, with the only sign of humans being yurts (a kind of traditional round tent) or simple makeshift barracks. One of the families invites us over for tea and a cornucopia of dairy products, kymyz (fermented horse milk) being their favorite refreshment on a hot day. The hosts themselves observe Ramadan (or Ramazan as they call it here) and decide to adhere to the fast, with the exception of the younger kids. Several hours, one taxi drive, one hitch-hike and one marshrutka (minibus) drive later, we arrive in Bishkek. The last day we visit the famous Osh Bazaar (basically the only tourist attraction in the city), get ourselves inspected by some dodgy plainclothes policemen and spend the night on a construction site near the airport. At 5:30 am, the plane takes us back to Europe. Mission complete! For a more thorough description of the journey, you might like to check out our blog (Polish only).